I thought that it would be great to do some Spring makeup look series. I'm trying out some bright and colorful makeup looks for this season that is still very much wearable. I love my neutrals and occasionally I do dabble with bright makeup but I think for this year I'd do more colorful makeup especially this season. Makeup always helps me bring up my mood so I hope this Spring Series Makeup Looks would brighten your days too! Physicians Strength Concealer Rx in Natural Light & Kat Von D Lock It Tattoo Concealer - As I said in my previous makeup look, I've been loving this combination of concealer for my very dark circles. Rimmel Stay Matte Translucent Powder - I just applied this on top of my concealer to set it. NYX Powder Blush in Bourgeois Pig - Since this is a bright pink blush, apply lightly on the apples of the cheeks for a nice flush. Urban Decay Primer Potion in Original - Start off with a primer, apply all over the lids and on the bottom lash line. NYX Jumbo Pencil in Milk - Apply Milk all over the lids and blend out with your fingers until smooth. UD 15th Anniversary Palette - Using the shade Omen (a lilac shade with micro glitters) apply all over the lids as well on the inner half of the bottom lash line. Taking the shade Half Truth (a deeper shade of lilac) apply it on the outer V of the eyes using a crease brush and with a pencil brush or the tip of a flat shader brush, bring it to the outer half of the bottom lash line as well blending it with Omen. Take a clean fluffy brush and blend all the harsh lines on the lids. NYX Glide On Pencil in Brown Perfection - Line the upper lash line and tightline the bottom and lower waterline as well. Milani Color Statement Lipstick in Hot Pink Rage - This hot pink lippie will definitely clash with the color of the eyes but I sheered it out by blotting it on a paper towel and blending the remaining product on my lips with a clean finger. You are so pretty! Only wish i was on drier side skin typed, fit me foundation would be great on me because i love the coverage of it. But it melts my skin off within 30 mins :(. Your eye makeup is stunning!! Oh no! I love Fit Me Foundation. It has been one of my favorite drugstore foundation since I got it. 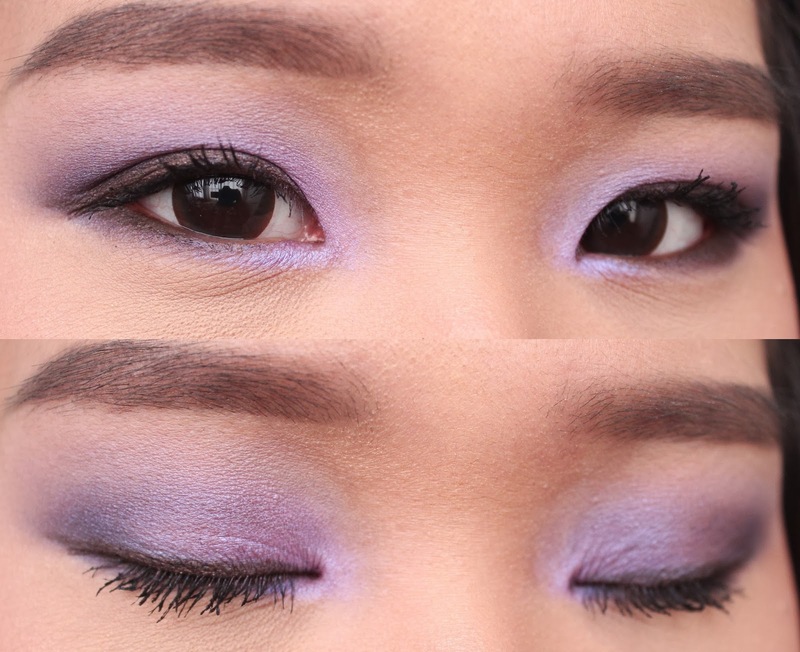 Ooh this is such a beautiful look - lilac is perfect for spring!